Last night we were parked at Eggum which is supposed to be one of the best places in Norway to view the Midnight Sun - but there wasn't even a flicker of a chance of that!! The day had been mostly overcast with occasional showers but as the evening chugged in a sea fung drifted up and almost obliterated everything - in fact it almost went dark!! And this morning as we were getting ready to leave a dankness still lingered, and maybe because of that, we were very undecided what to do with our day. In the end we decided to take a slow meander back Northwards towards Lodingen from where we planned to catch a ferry back over to the mainland tomorrow. This was our chosen route because the more popular Moskins to Bodo route would have cost 2,700 Nok (£250) and taken 3 hours, but the Lodingen one was much quicker and only 668 Nok (£63), and it also allowed us to miss out the Bodo town tolls - therefore winner winner!! The first part of today's drive took us to a scenic vantage point called Torvdalshalsen which offered magnificent views over most of Vestvagoy Island! Then after our coffee break we headed back towards Svolvaer but I was quite convinced that our chances of seeing 'Svalvaegeita' would be zilch because of the ongoing low cloud. But we were in luck - the low cloud cleared just enough to allow us a glimpse of the 'Svolvaer Goat' which is a pinnacle of rock with 2 'horns' and a place where individuals who have taken leave of their senses jump from the large horn to the small one!! From there it was forwards and onwards, but as we went we were keeping a very watchful eye out for a place to wild camp - and just after another long tunnel we came across one of the best ones so far on this trip. Unfortunately it'd got a sign to say 'this is a resting place and overnight stays aren't permitted' but as it was so perfect we decided to ignore that (along with 3 other vans)😮! From the road it had been almost obscured from view, and to get to it we needed to nip down a gravel track for about 100 metres. Then it opened out and we found ourselves right at the tip of Innerfjorden (which is part of Yitterfjorden), thus we were not only provided with fantastic views along the waterway, but also of the towing Mt Moysalen on our right. Therefore, although it was still quite early in the day (3ish) we parked up and spent the afternoon socking up both the sunshine and the view. 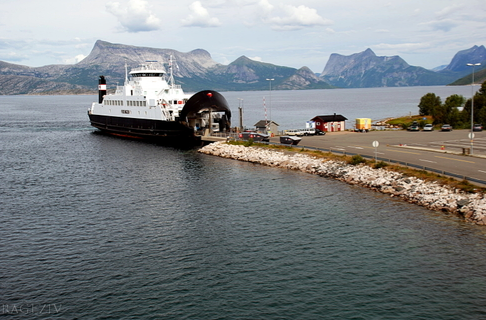 Mileage 103 from Mt Moysalen on the Lofoten Islands to Sommerset, Sorfold on Norway Mainland. This morning was another quite miserable one with a continuation of the heavy rain that had started in the early hours - so although our parking spot was beautiful there was no reason to delay our departure, especially as we didn't know the ferry times. However, we were quite lucky because we arrived at 11am and the next departure was 11.45 so we didn't have to long to wait. The crossing took just about an hour but we were a bit disconcerted when a crew member came round to distribute sick bags - it got a bit rough about half way over when 2 cross currents caused the waves to swell, but other than that it was fine! 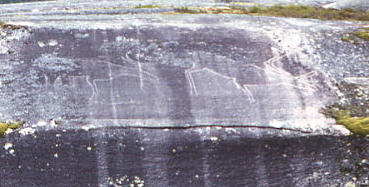 2 Reindeer on polished rock - so lichen and moss don't stick to it. Once off the ferry we recommenced our journey towards Fauske but we didn't really intend to go all the way there today. Instead we stopped off to see Sagelva's rock sculptures, which are thought to be around 9,000 years old. Now, you could say that what we saw wasn't very impressive but we learnt that the outlines of the creatures were polished into the glacially smoothed rock and apparently that technique is unknown any where else in the world. John peering at the salmon ladder! Then once playtime was complete we continued on to seek our resting place for tonight. We ended up on an old disused wharf well away from the road and in the company of several other vans - and once again we haven't got to pay 😂! Mileage 114 from Sommerset to Storvika Resteplass. Today was a day of many tunnels - 18 of them altogether which collectively covered a distance of about 19 kilometres - and at the start of our journey it seemed that no sooner had we popped out of one than we were heading deep into the depths of another!! Unfortunately, we needed to top up our food stock and LPG so our first stop was in the town of Fauske which had both so our mission was soon done. But after that, as we tried to head for the FV17 which would take us along a National Tourist Route called 'Helgelandskysten' Mrs Snoopy seemed to want to put a spanner in the works! She was quite determined to take us via the main road to Bodo (which was in the opposite direction to the one we wanted to go and much further), but luckily John quickly realised she was up to no good, but couldn't initially work out why. And then the penny dropped - she was programmed to avoid the dreaded TOLLS but once he explained that we could afford one or two she happily settled down and cooperated with taking us the way we wanted to go. The route is 433 km long and is connected by six ferries ( of which I think we're only going to take 4). It's mostly coastal and along the way it takes in views of an archipelago that consists of more than 14,000 islands, lots of craggy peaks, lots of fjords and also several natural phenomena which we would be unlikely to see elsewhere - but I'll tell you about them as we get to them! Additionally it will take us back across the Arctic Circle, so after more than 3 weeks of it never going dark, night will be another strange experience for us to get used to again! The first of the unique phenomena was at Saltstraumen which is the place of the world's largest tidal current where a maelstrom is created in a 3 kilometre long and 150 metre wide strait between Skjerstad Fjord and Salten Fjord. Apparently 400 million cubic metres of water flow through Saltstraumen in about 6 hours balancing high and low tide between the two fjord basins. 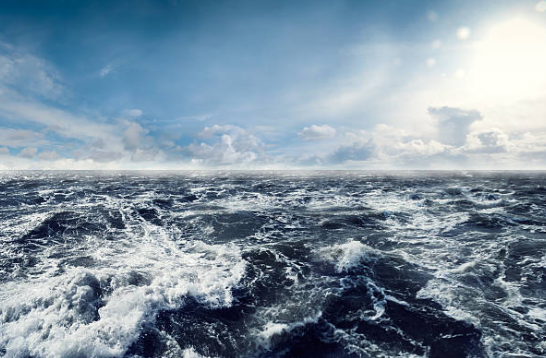 The maelstrom can reach speeds of 20 knots and this results in whirlpools of up to 10 metres that are locally known as 'cauldrons'. The direction of the current changes every 6 hours and for a short period the strait is supposed to lie quite still, then the current picks up speed and the masses of water cascade in the opposite direction. We hung about for quite a while to try and witness this - it was time-tabled to happen just after 4pm, but no - the flow just kept on flowing in the same direction it had been going ever since we arrived - it was just like a huge Jacuzzi and quite fascinating to watch! Then after we'd whiled away several hours there we moved on to Storvika where we settled for the night on their rasteplass - and as there was a shop on the site we even treated ourselves to a pint of Guiness 🍻! The first part of today's journey took us further along the FV17 - but not as far as we'd originally planned - and that was because we decided to allow miserable weather to stop play! The route is a very beautiful one but today's low cloud, swirling fog and at times torrential rain were obliterating many of the vistas, so after only a short drive of 40ish miles we decided to park up and sit it out! Sunshine is forecast for the next few days and as we've still got loads of time in Norway we can easily afford to loose a day's travel! However, today wasn't completely without interest! 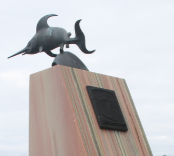 First up was a sword fish mounted on a plinth over looking the sea - a memorial for a submarine crew of British/Norwegian nationality who lost their lives when they were sunk in a German mine-filed in 1943. There were also loads of waterfalls cascading down the mountains, and did I mention the tunnels? There were only 5 today but the 3rd was 7.5 km long and that really gave me the heebie jeebies (which translates as a state of nervous fear or anxiety!) When we're deep inside some of the old ones it's dark, cold, smelly (damp earth) - and quite often lonely as there are no other vehicles in sight, and that's when I start to think about the many many tons of earth and rock above us and just exactly 'what' is holding it all up? After the tunnel we didn't have far to go to the next area that is highlighted as one of specific interest and that was a view point that looks over Holandsfjord to the Svartisen Glacier. Svartisen is Northern Norway's largest glacier (and the second biggest in the whole of Norway), and the info boards told us that the glacial mass can move up to 2 metres in 24 hours - so we're going to stay here overnight to see if we can detect any motion 😂😂! It covers an area of 400 square kilometres with a maximum thickness of 600 metres, and apparently it plunges from a height of 1200 metres down the mountainside almost to the edge of the fjord from where we're viewing. And even in today's poor light the colours from the glittering ice displayed themselves in a range from white to pale blue to turquoise, and I'm sure that in the reflection of the sun the hues would be even more magnificent. Also the scale of it is quite phenomenal - John had his telescope out and we've watched a couple of groups climbing it's very convoluted slopes - they almost looked like 🐜🐜🐜🐜🐜 and it took them a very long time to travel a very little distance!